As Jiang Ziya avoids Daji’s tails, she casts a magic spell at him. To save him, the chief digs out one eye and throws it towards Daji to distract her, but he gets destroyed by her tails instead. Jiang Ziya escapes to his crane with one of the chief’s eyes, while the other eye is obtained by Daji. Those aren’t inaccurate or even particularly extravagant either – I recommend the entire thing as an exercise in the straight-faced recounting of “Wait, what?” moments. 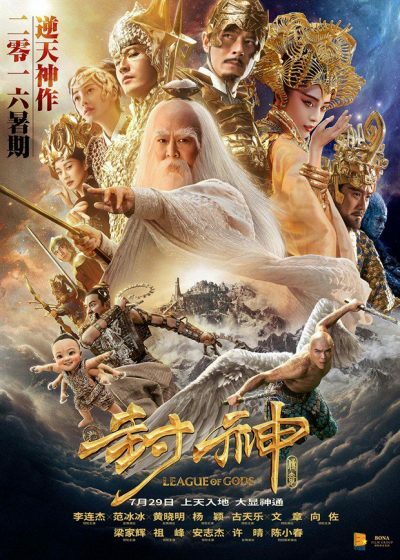 But reduced to its most basic, it’s a heroic quest, based on a 16th-century Chinese novel. 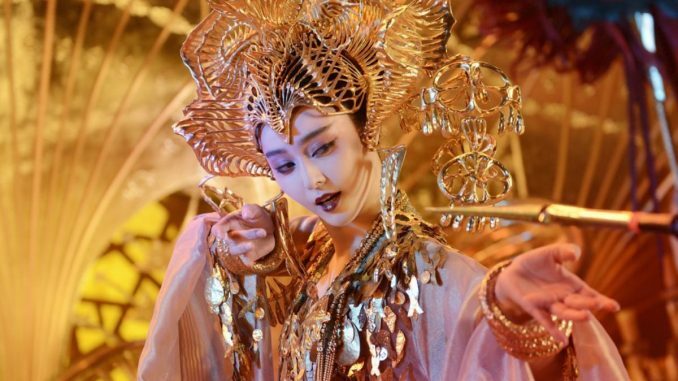 Leizhenzi (Heung) is sent on a mission to obtain the Sword of Light, which is the only artefact capable of defeating the evil King Zhou (Leung Ka-Fai). He’s helped on the quest by Gandalf Jiang Ziya (Li), though he has been affected by a reverse aging spell, so gets younger every time he shows up. There are also three gifts to assist Leizhenzi: a plant with one eye, a baby Dragon Prince, and a dog known by what I can only presume is its kennel name, Howling Celestial. It’s the six-armed baby which provides the film with its peak moment of insanity: fighting the underwater Dragon King of the East Sea with his urine stream, which he also uses to propel himself around like an infantile, flying water scooter. No, this film is certainly never boring. Unfortunately, that’s the best thing that can be said about it, for it’s also incoherent, throwing elements at the viewer without even the feeblest effort at explanation, contains no memorable characters (choosing instead to bury just about everyone beneath excessive CGI and/or even more ludicrous hats – an example is at the top) and doesn’t so much wrap up and finish, as drive head-on into a concrete overpass. It’s cinema apparently made by and only for ADHD sufferers. This ill-advised challenge was clearly accepted. Now, if you’ll pardon me, I’ll going to find a dark cupboard in which to lie down for a couple of days.